For Windows Developers who need to transcode high quality audio and video files playable on most mobile devices such as the 3GP, FLV, H.264, iPod, PSP in ASP, ASP.net, Adobe Director, Php, C#, C , VB.net , VB, Delphi. Create Subtitle file (srt file). join/merge a lot of video/audio files into ipod, psp , avi or wmv files , even if these media files are of different file formats. 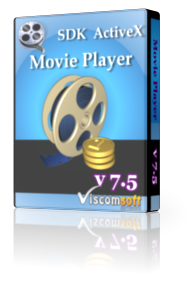 extract video/audio track from mpg, wmv, avi, mp3, wma files and then save to ipod, avi (uncompressed)/(compressed using any available codec), or wmv files. add a number of image ,sound files and then create ipod, avi or wmv files. Include ASP.Net, vb script, c#, Vb.Net, VB Sample Code. fixed decode video issue when create multiple instance of ActiveX. e.g. using the video edit mobile activex on two form. fixed output MP4 video have green bar at bottom issue when convert some video to H264 MP4 video. improved some performance when output H264 MP4 video. fixed sometime crash when output H264 MP4 video. fixed 4:3 or 16:9 ratio issue when output H264 MP4 video. Fixed cannot playback or convert some youtube FLV, F4V video. Updated FLV, F4V decoder , fixed lost frame issue. fixed c# 2010 and vb.net 2010 samples cannot run on 64 bit OS issue. added allow add F4V plugin , then support input F4V video. added support input UNICODE media files, OverlayAddText method support UNICODE. updated AVCHD decoder, fixed cannot decode some m2ts video files. added support load subtitle file (srt file) and display on video. added support create subtitle file (srt file). 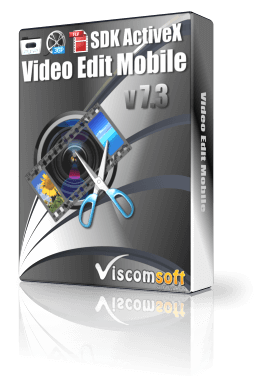 redesigned video editing engine.Now support unlimited video tracks and audio tracks. updated when output mov file if the computer have not installed qt player, it will crash issue. added support video mixing and audio mixing. added support chroma key video effect. added support Picture in Picture video effect. added support Picture in Picture with multiple zone video effect. added support Adjust audio volume or add crossfade audio effect at any point on the timeline using unique volume track. improved images or videos transition with background audio sync issue. updated samples show you how to use wmv profile editor activex output HD wmv 9 video. added vs2010 vb.net, vs2010 c# samples. updated AddEffect method allow add effect on specific video track. added AddKeyTransparentEffect, AddPicInPicEffect, AddVideoMixingEffect, AdjustAudioVolume, MultiTrackAddFirstAudio, MultiTrackAddFirstVideo, MultiTrackAddNextAudio,MultiTrackAddNextVideo methods. SubTitleSetShadow, SubTitleSetShadowColor, SubTitleSetTextColor, SubTitleSetTopPos methods. added allow transcode to H.264 video. added allow change the frame rate when output flv video. added allow add AVCHD video (m2ts, ts, m2t, mts) decoder plugin for transcode AVCHD video. added allow use MPEG layer 3 audio codec when output avi file and adjust mp3 bitrate, sample rate value. added allow adjust the audio volume when preview the video. GetFrame, GetFrame2HBITMAP, GetFrame2Picture, GetFrameBySize, GetFrameBySize2HBitmap, GetFrameBySize2Picture methods support FLV and DIVX video. added ResizeControl method, it allow resize the display area. redesign overlay text, overlay image engine. Now it can display text or image smoothly , control fade in, fade out, shadow effect. added allow add overlay text or image at specific time. added scrolling banner text on video, allow to control the scrolling direction, scrolling speed, font, font size, font style, text color, background color, alpha blending value. removed OutlineText, TextureBrushImage,HashBrush Text, DrawText, DrawImage methods. added OverlayAddText, OverlayAddImage, OverlayDelAll, OverlaySetFont, OverlaySetSpeed, OverlaySetState, OverlaySetTextBgColor,OverlaySetTextColor, OverlaySetTextScrollDir,OverlaySetTextShadow methods. added support input vob file. redesign mpeg2 decoder, increased the performance. redesign the transitions engine, now you can create video slideshow or image slideshow more easy. added allow support input MPEG2 video. added support input FLV and output 3GP, FLV video. added support output PSP video.